*HEART SERIES* Variegated bright pinks with hints of orange for the fiery heart. Details of eyelet and lace edging. 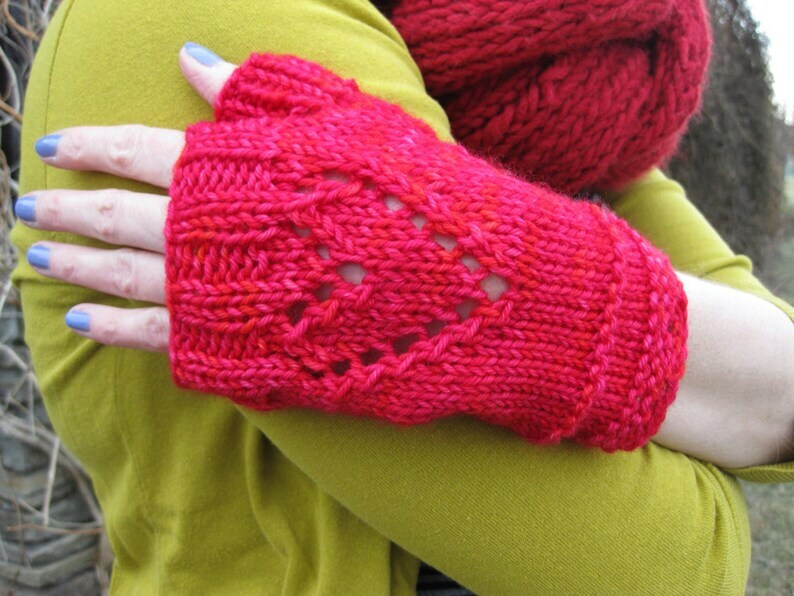 A generous length and thumb provide warmth yet your fingers are free to truss and torch. Size: 7-inch length. Easily fit 7-inch circumference (should fit average woman's hand). Care: Hand wash gently in cool water; blot with towel and air-dry. Designed and knitted in New York City in a smoke-free environment. Got the Eiffel Chrome fingerless mitts in no time flat and have not wanted to remove them from my toasty warm hands ever since! I purchased 3 other items as gifts and can't wait to surprise my friends with these wonderful handmade gems!!! Cozy warm yet not real heavy. Like the two different color yarns. I LOVE this hat! It is and warm and beautifully made. The pattern and color are so pretty and the yarn is soft and silky. I bought the hat a while ago and couldn't wait for the cold weather to start so I could wear it. I'll be back for more in other patterns and colors. Love the lacy effect you captured in the knitting. Perfect for the chilly nights coming our way. And most of all now I have the mitts and hat to match. Awesome! I have my eye on a few more things. Payments can be made through PayPal, credit cards using PayPal, Etsy gift cards, or Direct Checkout (you can pay by credit card without using PayPal). --How do I purchase an item on Etsy? --How can I purchase an item with a credit card through PayPal? --How do I pay with an Etsy Gift Card? All New York residents will be charged 8.87% sales tax. I hope you will be happy with your purchase. Convo me within 2 days of receiving your purchase if you decide to return it. Only unworn items in original condition may be returned. Once the item is returned to me and deemed as undamaged, unworn condition, your payment will be refunded (shipping costs for returned items are the responsibility of the person returning it). TRACKING NUMBER REQUESTS: Items will be shipped without a tracking number. If you would like the item to be shipped with a tracking number for reference, the post office will charge an extra fee, which I will need to pass along. Please convo me to request a tracking number and to discuss what the additional cost will be. Thanks! Convo me for international shipping, as the buyer will be responsible for any customs duties or special fees that apply to international orders. Every effort has been made to provide accurate details and images of the items I handknit, but please keep in mind that color representation on monitors may vary. If you are not sure of a color or size as it appears here, please convo me. All items are shipped with a reminder of the fiber content and care. Handknit items should not be machine-washed; they should be washed gently by hand.